1853. George D. Klinehanse, The Manual of Instruction For Drummers, On An Improved Plan. Containing The Rudiments Of Drum — Beating; with rules for Common, Quick, and Compound Time: together with The Whole Of The Camp Duties Etc. prepared under the direction of the adjutant General of the United States Army, approved of by the commander-in-Chief And Adopted For The Use Of The Army Of The United States. 27 rudiments. Until it was replaced by the Gardiner A. Strube Instructor in 1869, the Klinehanse manual was the only drum book officially approved for military duty by the U.S. Army. The copy which I was allowed to photograph, resides in the Library of Congress in Washington DC. It contains 27 rudiments. The Poing Stroke appears below in the first measure of stave three and in The Rules To Be Observed By The Pupil, a brief one page introduction to his book, the author gives instructions for its use in the camp duty, to my knowledge the first and only such instructions regarding the Poing Stroke to appear in print. Those Rules also direct the drummer to place the heel of the right foot into the hollow of the left foot, exactly opposite to Potter’s instructions (see Part 2.). Klinehanse’s notation, left-hander above, right hand below and both on one stave is clear and reminiscent of The Young Drummers Assistant (see Part 1.) and Bruce and Emmett, Drummers and Fifer’s Guide, see below. According to US Department of Defense records, a George H. Klinehanse of Washington DC served in the Navy/Marine Corps during the Civil War in the United States (1861-65). The Klinehanse family appears to have been large, moderately well to do and involved in their community. At least two Klinehanse men served as trustees on local boards of education. 1861. Keach, Burditt and Cassidy, The Army Drum And Fife Book containing Full Illustrations, the Reveille, the Tattoo the various calls and beats used in the service and a choice collection of music to which is added the buglers call book, containing all the infantry general calls and calls for skirmishers, used in the U.S. 18 rudiments. This is the first book to appear with dual drum notation: that is, a separate space for the left and right hand and then below on another stave the same beat replicated in modern notation. Keach contains 18 rudiments, including the single stroke roll, an eight stroke roll, and a side Flamadidle, but no Poing Stroke. Modesty aside, Keach’s contribution to this book is one of the clearest expositions of the rudiments of drumming ever written. 1861-Keach, Burditt & Cassidy Boston, MA. 1861-1Keach, Burditt and Cassidy, Boston. This page from Keach may convey a seriousness of purpose more than precise details for drumming technique, but to my knowledge it is the first attempt to illustrate grip and stance in a drum book. Notice the heel of the right foot against the heel of the left. 1862. George. Barrett Bruce and Daniel Decatur Emmett, The Drummers’ and Fifers’ Guide or Self Instructor. 36 rudiments. On page four appears Rudimental Principles, containing paragraphs devoted to putting on drum heads, holding the drum and holding drumsticks. Then follows instructions for the long roll and 35 other rudiments in left-hand right-hand notation, each on one stave as seen in the example below. Bruce then repeats all the rudiments in modern notation. Fred Johnson the founder of the Canadian rudimental drum organization Canadian Associates Drumming Rudimental Excellence (C.A.D.R.E.) and a distinguished teacher of many fine field drum players suggested some years ago that the reason Bruce and Emmett’s “Guide” was never officially adopted by the United States Army was because too many of the drum beatings and fife tunes were simply beyond the capabilities of the average military musician of the era. 1862-Col. H. C. Hart, New York, NY. Ex.2. 1862-Col H. D. Hart, New York, NY. Ex.1. 1862, Elias Howe, Boston. United States Regulation Drum and Fife Instructor, for the use of the Army and Navy consisting of full rules and exercises, the duties of musicians on all occasions, Full Camp Duty, Signals, Calls, etc. also the complete bugle call for the infantry, artillery, and cavalry. Also the pay and emoluments of musicians, and of every grade in the Army or Navy to which is added Several Popular National and Patriotic Songs as Quartets. 24 Rudiments. The notation and layout in Howe appear to be even clearer than Keach already discussed above. As in Keach, the left-hand right-hand notation is also represented in the modern style on a separate stave below. 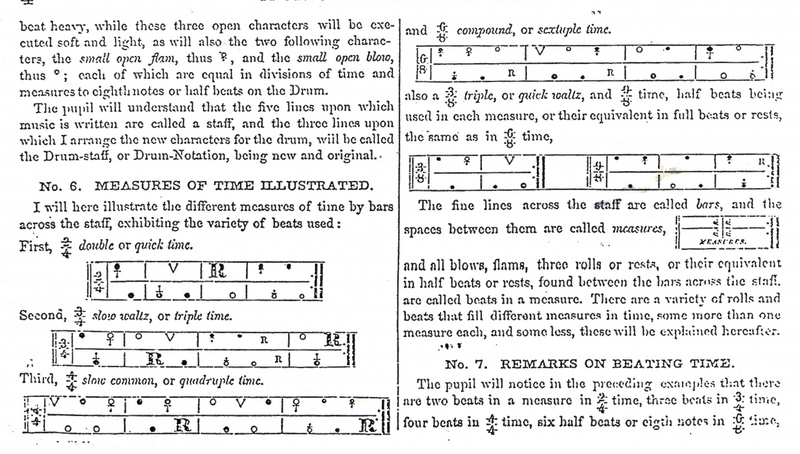 Howe devotes two pages to the drum rudiments and army camp signals in the notation of 1812 which he calls the Old English style. (His examples appear to be copied after Klinehanse and the Young Drummer’s Assistant.) Howe’s book contains the largest library of fife tunes among the books under discussion. The drum Beatings for these tunes are not as interesting as those of George B. Bruce, but they are clear and playable. 1864. William Nevins, Chicago. Drum Major of Gen. McClellan’s5 Body Guard. Army Regulations for Drum, Fife, And Bugle; being a complete manual for these instruments, giving all the calls for Camp and Field Duty, to which is added Suitable Music for each Instrument. 30 Rudiments including Poing Strokes: Hard, Middling Hard, Faint or Soft. Compare this notation with Klinehanse, above. When the National Association of Rudimental Drummers (N. A R. D.) was founded in 1933 its members adopted the 25 Rudiments of Gardiner A. Strube with the addition of the Single Stroke Roll and then selected from them a group which they called the 13 essential rudiments. Some rudimental drummers today trace their lineage back to Strube whilst others declare fealty to Bruce via Ashworth. 1869-Gardiner A. Strube, New York, N.Y. I believed one answer to have been vanity. The numerous drum books published in the United States during the first two decades of the 19th century, many of which boldly stated the superiority of their system and notation, assured me that vanity was indeed the raison d’être for some authors. Another possible answer, really a guess based on hearsay, was that military drum teachers were looking for a quick and simple way of teaching the signals, calls and rudiments of drumming to young boys new to military service. However, after studying the examples above and the books from which they are derived, I believe this to be untrue. My original intention was to end these examples of snare drum notation with the Strube book of 1869 because I believe the major issues of drum notation, at least in North America, had pretty well been resolved by the third quarter of the 19th century. But midway through this third article, serendipity intervened. An e-mail from my friend Doug Kleinhans, former Hellcat drummer with the West Point Military Academy, drum corps instructor and composer of brilliantly quirky snare drum solos, sent me the first notation shown below. A former student of his who had studied with the late great New England rudimental drummer Earl Sturtze, had sent Doug this manuscript. Doug thought the notation was called the “Connecticut Code” and that it was associated with the Lancraft Fife and Drum Corps.7 I contacted Lancraft’s Web master, fifer, restorer and publisher of historical fife and drum books, Edmund Boyle, sent him a sample notation and asked him what he knew about this “Code”. There ensued a correspondence with perhaps a half a dozen Lancraft members which in itself is a story. I learned that perhaps only one or two Lancraft drummers read music and this notation is a shorthand they use to learn their beats during all practices together and privately at home. I was told that they can learn and memorize a their beatings faster using this shorthand than drummers who read music. There are issues of phrasing and dynamics,etc. which are handled in detail, but teachers such as Earl Sturtze and Ken Mazur have it tested to the efficacy of this shorthand system and have only taken time to teach students how to read music when the student has demanded to be taught. Here then is another answer to my question, albeit modern. The Lancraft drummers do not refer to this as “The Code”, but depending on their teacher, they are all familiar with some short hand system. 2006-Thomas Sanders Medley, Snare drum in Lancraft shorthand. 2006-Thomas Sanders, Ken Masur shorthand version. Thomas Sanders, Jay Tuomey, page 2., copied by Risto Skrikberg. 1. From a three CD set, Trommeln und Pfeifen in Basel, Ursprunge Entwicklung Perspektiven,CD181996. BREO. This is an aural history of drumming in Switzerland performed by some of Switzerland’s greatest drummers from old and modern manuscripts. A large, copiously illustrated booklet (In Swiss) accompanies the set. 2. Praise indeed. Two compositions by Edward (Ned) Kendall were chosen by George B. Bruce and Daniel D. Emmett for inclusion in their famous Drummers and Fifer’s Guide of 1862. They appear on page 69, “Ancient and Hon. Artillery” and 70, “Ned Kendall’s”. 3. Concerning the “Downfall of Paris”, arguably Bruce and Emmett’s masterpiece, the legendary drummer, author, and drum maker Sanford A. “Gus” Moeller wrote, “it has always been the pride of the schooled drummers, not only to play it so it sounded correct, but also to beat it in the prescribed way. When drummers from different parts of the country get together and drum such beats as this with perfect uniformity they prove themselves worthy brethren.” Please see my article, “Le Carillon National, Ah! ca Ira and the Downfall of Paris”. 4. When I began working on Hart’s system, I was reminded of some of the contemporary Western art music compositions I had to learn during the 1960s, 70s and early 80s which required players to learn unique notations devised by the composer; this was all the rage among certain composers of the period. As a percussionist my task was doubly vaunting. I had many instruments to gather and arrange and I also had to learn a new notation, sometimes a different one for each piece on the concert! 5. George B. McClellan (1826-85) was nicknamed Little Mac or The Young Napoleon by the troops under his command who usually thought highly of him, but after the Peninsula Campaign and the Battle of Antietam, he was sacked by Pres. Lincoln. Gen. Ulysses S. Grant called McClellan an enigma. Even so, McClellan had powerful supporters and ran as a Democratic candidate in opposition to Lincoln in the 1864 presidential campaign, but was beaten decisively. During the last years of his career, he served as governor of New Jersey (1878- 86) and wrote a memoir defending his actions, many might say, inactions, during the Civil War. 7. The Lancraft Fife and Drum Corps, now of North Haven. CT. was founded in 1888 and named after an oyster man, one Ed Lancraft who befriended the corps by providing them with uniforms and rehearsal space. Later on he purchased drums for them which were in the shape of oyster barrels and for awhile the Corps was known as the “Oyster Kegs”. In 1970 the great Swiss basel drummer Alfons Grieder who had heard the corps while studying in the United States, invited Lancraft to Switzerland and for his efforts Alfons was made an honorary member of the corps. Lancraft has been blest with some of the greatest field drummers in North American history: Sanford A. ‘Gus’ Moeller not only played in the corps, but made five drums for them in 1954 for $85 a piece!, Frank Arsenault, Earl Sturtze, and Jay Tuomey (mentor to the Finnish rudimental pathfinder Risto Skrigsberg),- a drum line for the ages. Three wonderful articles! Thanks so much for doing this Robin.